aFrom the Department of Radiology, Sint Elisabeth Ziekenhuis, Tilburg, the Netherlands. BACKGROUND AND PURPOSE: The Woven EndoBridge (WEB) device was recently introduced for intrasaccular treatment of wide-neck aneurysms without the need for adjunctive support. We present our first experience in using the WEB for small ruptured aneurysms. MATERIALS AND METHODS: During 11 months, 32 of 71 (45%) endovascularly treated acutely ruptured aneurysms were treated with the WEB. The patients were 12 men and 20 women, with a mean age of 61 years (range, 34–84 years). The mean aneurysm size was 4.9 mm, and 14 were ≤4 mm. Of 32 aneurysms, 24 (75%) had a wide neck. RESULTS: All 32 aneurysms were adequately occluded after WEB placement. There were no procedural ruptures and no complications related to the WEB device. No adjunctive stents or balloons were needed. In 3 patients, thromboembolic complications occurred. One patient developed an infarction, and 2 patients were asymptomatic. The procedural complication rate was 3%. Seven patients admitted in poor clinical grade conditions died during hospital admission due to the sequelae of SAH. In 18 patients with angiographic follow-up at 3 months, 16 aneurysms remained adequately occluded. Two aneurysms showed slight compression of the WEB without reopening. Clinical follow-up in the 25 patients who survived the hospital admission period revealed mRS 1–2 in 24 and mRS 4 in 1. There were no rebleeds from the ruptured aneurysms during follow-up. CONCLUSIONS: WEB treatment of small ruptured aneurysms was safe and effective without the need for anticoagulation, adjunctive stents, or balloons. Our preliminary experience indicates that the WEB may be a valuable alternative to coils in the treatment of acutely ruptured aneurysms. Recently, an intrasaccular flow disruptor, Woven EndoBridge (WEB; Sequent Medical, Aliso Viejo, California), has been developed. The primary use of the WEB is the treatment of bifurcation or wide-neck aneurysms without the need of adjunctive devices. There is a growing body of literature on the use of the WEB device with excellent safety and efficacy profiles. Most of the published series comprised wide-necked, unruptured aneurysms.4⇓⇓⇓⇓⇓⇓⇓⇓⇓⇓⇓–16 When the WEB became available in our hospital, our initial results in unruptured aneurysms were encouraging, and we decided to expand the indications to both ruptured and unruptured aneurysms suitable for accommodating a WEB device, regardless of neck size. Our intention was to avoid using stents or balloons in ruptured aneurysms. In this article, we present our first results of the use of the WEB device in small ruptured aneurysms. The WEB device was initially developed for the treatment of wide-neck intracranial aneurysms as an alternative to balloon- or stent-assisted treatment. After our first experiences in unruptured wide-neck aneurysms, during the study period we decided to gradually expand the indications to all aneurysms suitable for the WEB, regardless of neck size or rupture status. In general, these are aneurysms of ≤10 mm with a shape and geometry suitable for catheterization with a 0.021-inch microcatheter and with a possible fit of a pumpkin-shaped or spheric WEB device. With the patient under general anesthesia, we advanced a microcatheter (VIA 0.021 inch or VIA 0.027 inch; Sequent Medical) into the aneurysm via a coaxial or triaxial approach. Apart from heparin in the pressure bags for flushing (1000 IU/L), no anticoagulation was used. Patient demographics and treatment and aneurysm characteristics were collected. Clinical grading during admission was according to the Hunt and Hess scale, and clinical follow-up was classified according to the modified Rankin Scale. For surviving patients, angiographic follow-up was scheduled at 3 months, and MR imaging follow-up, at 6 months. Between February and December 2015, 134 intracranial aneurysms in 128 patients were treated in our institution (Fig 1). Six patients had 2 treated aneurysms. 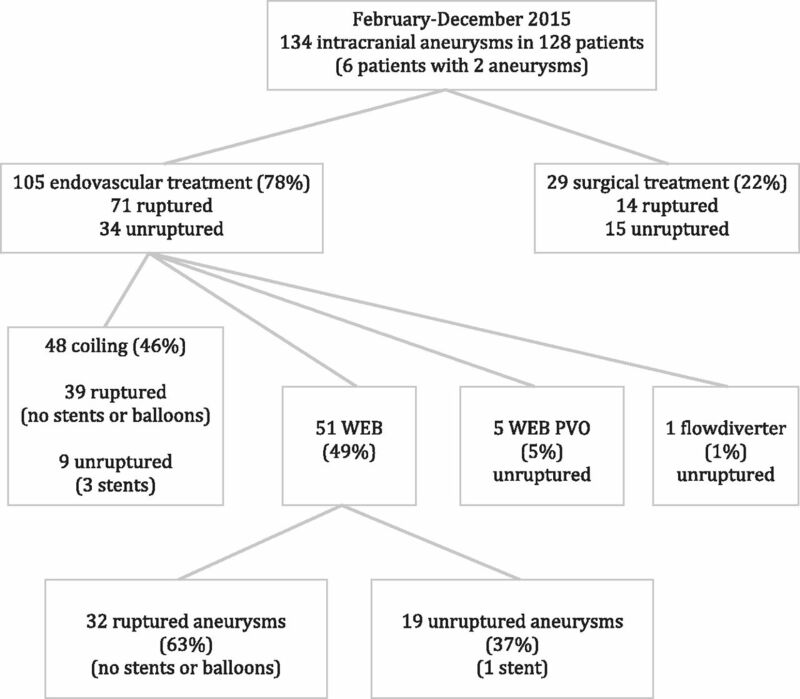 Flow chart of all treated patients with aneurysms between February and December 2015. PVO indicates parent vessel occlusion. Of 134 aneurysms, 105 (78%, 71 ruptured and 34 unruptured) were treated with endovascular techniques and 29 aneurysms (22%) were treated surgically. Of 71 ruptured aneurysms treated endovascularly, 39 (55%) were treated with selective coiling and 32 (45%) were treated with the WEB. The 32 patients with a ruptured aneurysm treated with the WEB were the subjects of this study. There were 12 men and 20 women with a mean age of 61 years (range, 34–84 years). Clinical condition at the time of treatment was Hunt and Hess 1–2 in 14, Hunt and Hess 3 in 9, and Hunt and Hess 4–5 in 14 patients. The timing of treatment after SAH was 0–1 day in 26, 2–4 days in 4, and >4 days in 2 patients. Aneurysm location was the anterior communicating artery in 11; middle cerebral artery in 8; posterior communicating artery in 7; pericallosal artery in 3; and basilar tip, superior cerebellar, and ophthalmic arteries, 1 in each. The mean aneurysm size was 4.9 mm (median, 5 mm; range, 3–12 mm), and 14 aneurysms were ≤4 mm (Figs 1 and 2). Of 32 aneurysms, 24 (75%) had a wide neck defined as ≥4 mm or a dome/neck ratio of ≤1.5. Three patients had 2 aneurysms treated in the same session, 1 with WEB and 2 with coils. 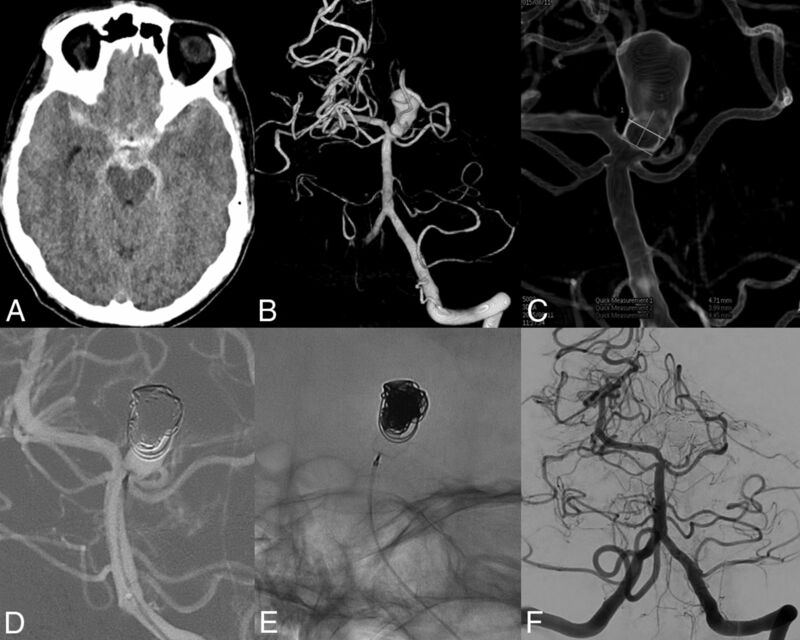 A 61-year-old man with a ruptured basilar tip aneurysm treated with the WEB and coils. A, CT scan with subarachnoid blood. B, 3D angiogram reveals a 13-mm basilar tip aneurysm. C, Neck measurement on a 3D angiogram. D and E, After placement of coils in the dome and a WEB-SL, 6 × 3 mm, in the neck. F, Three-month follow-up angiogram with complete occlusion. After WEB placement with sealing of the aneurysm neck, the position of the WEB inside the aneurysm was judged as good in 31 aneurysms without filling of aneurysm remnants. In 1 patient with a ruptured pericallosal artery aneurysm, a small aneurysm remnant was present. In 2 patients, coils were placed in the aneurysm dome through a jailed second microcatheter before detachment of the WEB (Fig 2). There were no procedural ruptures and no complications related to the WEB device. In 3 patients, thromboembolic complications occurred with occlusion of an M2 branch in 2 and a P3 branch in 1. All 3 vessels could be reopened during the procedure by mechanical thrombectomy. One patient developed a partial middle cerebral artery infarction, and 2 patients were asymptomatic. In 1 patient, catheterization caused a dissection of the internal carotid artery, which was successfully treated with a stent. Of 32 patients, 7 died during hospital admission due to sequelae of SAH. All 7 patients were admitted with poor-grade conditions (Hunt and Hess 4–5). 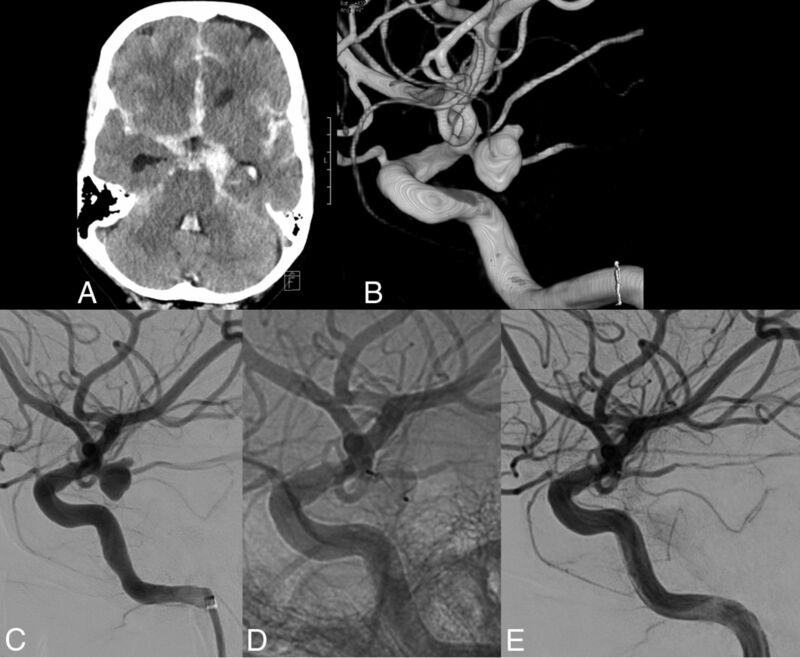 One of these patients had a thromboembolic complication in an M2 branch during treatment, leading to partial right frontal brain infarction (procedural mortality, 3%; 1 of 32; 95% CI, 0.01%–17%). Of the remaining 25 patients, 18 had 3-month angiographic follow-up and 6 of these 18 had 6-month MR imaging follow-up. In 7 patients, imaging follow-up is pending. Fifteen aneurysms (83%) remained completely occluded (Figs 3 and 4). One aneurysm remained subtotally occluded. Two aneurysms showed opacification of the central recess due to slight compression of the WEB. In all 6 patients with MR imaging follow-up, the aneurysm was stable in the 3- to 6-month period. Clinical follow-up in the 25 patients who survived the hospital admission period revealed mRS 1–2 in 24 and mRS 4 in 1. There were no rebleeds from the ruptured aneurysms during follow-up. A 57-year-old woman with a ruptured anterior communicating artery aneurysm. A, 3D angiogram shows a small anterior communicating artery aneurysm. Note the spasm in the left A1. B, Measurement of the height (3.9 mm) and neck width (2.3 mm). C, Angiogram directly after placement of a 4-mm WEB-SLS. Note some opacification inside the WEB. D, Angiogram at 3 months demonstrates complete occlusion of the aneurysm. A 42-year-old man with a ruptured anterior communicating artery aneurysm. A, 3D angiogram shows a small anterior communicating artery aneurysm with a bleb pointing upward. Angiogram before (B) and after (C) placement of a 4-mm WEB-SLS inside the aneurysm. Note complete aneurysm occlusion with slight protrusion of the WEB into the parent vessel (arrow). D, Angiogram at 3 months demonstrates persistent complete occlusion. Our initial experience with endovascular treatment of ruptured intracranial aneurysms by using the WEB device was encouraging. 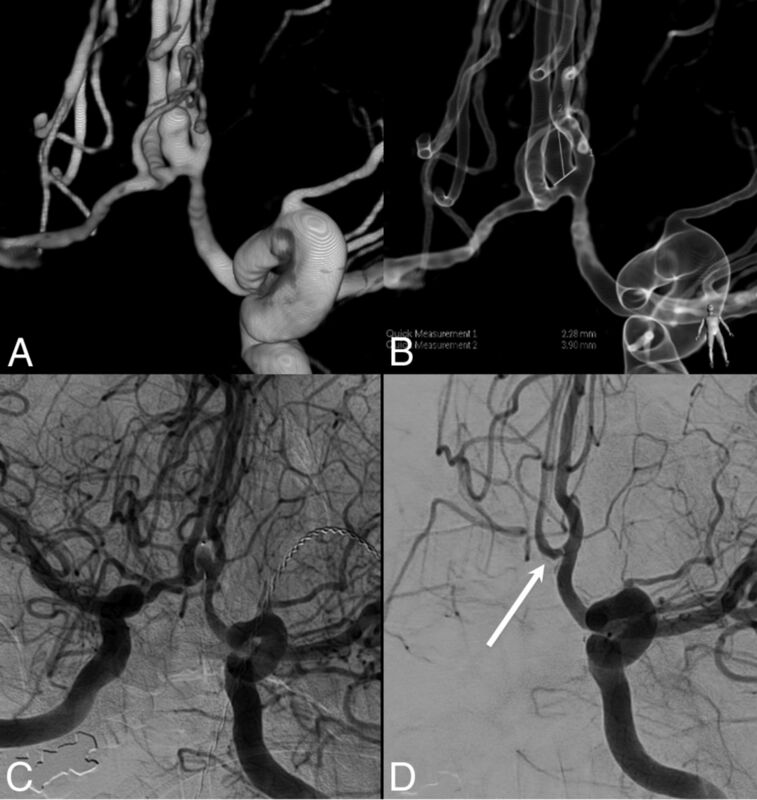 With growing skill and confidence, more and more, even small, ruptured aneurysms were treated with the WEB, in addition to small aneurysms with a small neck (Fig 5). During the study, 32 of 71 endovascularly treated ruptured aneurysms (45%) were treated with the WEB. Once the microcatheter was inside the aneurysm, deployment of the WEB was technically straightforward and quick in most cases. Despite aneurysms being very small, no procedural ruptures occurred. The detachment system proved fast and reliable. In most cases, the position of the WEB after deployment in the aneurysm was easily evaluated. With complicated anatomy, a 3D angiographic run proved helpful in exactly delineating the position of the WEB inside the aneurysm lumen and in relation to the parent vessels. In wide-neck aneurysms, the WEB-SL bridges the neck without the need for a stent or balloon. (Examples of WEB treatment can be found in the On-line Videos). In fact, in none of the 71 endovascularly treated ruptured aneurysms was balloon- or stent assistance necessary (Fig 1). A 60-year-old woman with a ruptured small-neck posterior communicating artery aneurysm. A, CT scan shows subarachnoid hemorrhage. B, 3D angiogram reveals a 6-mm posterior communicating artery aneurysm with a small neck. Angiogram before (C) and after (D and E) placement of a 6-mm WEB-SLS shows complete aneurysm occlusion. In our opinion based on our own and previous experience,17 the most important aspect of the WEB treatment was the sizing. Oversizing the WEB seems crucial for good immediate and long-term results. With oversizing, the WEB anchors itself against the aneurysm wall while bridging the neck completely. Oversizing the compressed WEB width results in increased height, and one has to be sure that the aneurysm can accommodate this augmented height. Oversizing protects against displacement, overturning, and compression of the WEB during follow-up. In small aneurysms, oversizing of 1 mm will usually be sufficient, while in larger aneurysms, at least 2-mm oversizing is necessary for stably securing the device in the neck. A stable position of the microcatheter inside the aneurysm is important for WEB deployment. The WEB system is slightly more rigid than most coil systems, and negotiating slack in the microcatheter during advancement may result in unwanted forward or backward movement of the catheter tip. Therefore, advancing the WEB should be done under constant fluoroscopic control. Distal-access guiding catheters are preferably used to enhance the stability of the microcatheter. We used the newer 0.021-inch VIA microcatheter in the treatment of small aneurysms in WEB sizes up to 7 mm. Although this microcatheter is less rigid than the 0.027-inch one used in previous studies, the system is still stiffer than most coil systems. 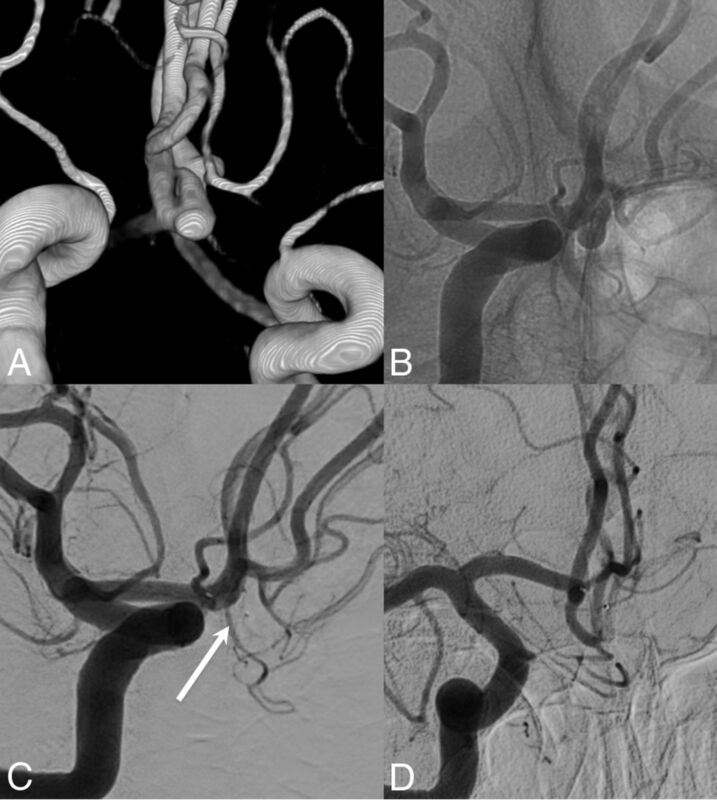 In fact, negotiating the curve into the A1 for anterior communicating artery aneurysms proved impossible with the VIA 0.021 in 6 cases, and all 6 aneurysms were coiled with 0.017-inch microcatheters. However, the recently introduced lower profile VIA 0.017 microcatheter will probably overcome most problems encountered with the thicker microcatheters. Our excellent clinical and imaging results are in concordance with those in previous studies.4,6⇓–8,10,15,16 Complications were low; there were no procedural ruptures, no early rebleeds, and no reopenings at short-term follow-up. However, our patient group with only ruptured small aneurysms differed from those in other series, in which mostly wide-neck unruptured aneurysms were treated. In our opinion, WEB treatment of ruptured intracranial aneurysms is feasible and safe. The WEB can be a valuable alternative to coils in many aneurysms and reduces or eliminates the need for adjunctive devices such as stents and balloons. Anticoagulation in the periprocedural period is not necessary; this finding is a great advantage in view of possible surgical procedures that are needed in patients with acutely ruptured aneurysms. In our practice, WEB treatment has become the first choice in both ruptured and unruptured aneurysms. Disclosures: Willem Jan van Rooij—UNRELATED: Payment for Lectures (including service on Speakers Bureaus): Sequent Medical; Other: proctoring WEB cases. Jo P. Peluso—UNRELATED: Payment for Lectures (including service on Speakers Bureaus): Sequent Medical; Other: proctoring WEB cases.